These images of flowers are, for the most part, wildflowers that the artist lovingly drew and painted over many years walking the hills and the footpaths of the 'Riviera of the Flowers,’ as the region between St.Tropez on the French Riviera and Sanremo is known. From here comes the 'Tequila Rose' of Sanremo. Others are wildflowers collected in the Italian Alps in the region of Mont Blanc such as the subtly delineated 'The Bouquet.' 'Flora,' garnished with the flowers and fruits of autumn is inspired by a similarly titled painting by Rembrandt showing Saskia as the Goddess of spring and flowers. In the medieval Ligurian villages on the Italian Riviera, Costa Rainera, extraordinary and beautiful wild flowers still grow today. The village of Costarainera where Matthew captured the delicate form of this flower retains the original old stone archways and medieval structures typical of Ligurian coastal architecture. The unique style of the ancient defenses the villagers erected developed as a result of the need for protection against the Saracen pirates who continued to ravage the coast until into the eighteenth century. In the Spring, these flowers will appear suddenly abutting the thousand year old cobbled track that leads down from the village to the small port of San Lorenzo al Mare. Shortly before World War l, the seaside towns around Sanremo on the Italian Riviera began to follow the example of Grasse in the French Provence hinterland and created the modern floriculture industry, profiting by the Riviera's mild winter climate. The introduction of the railway system after 1868 to coastal towns like Monte Carlo* encouraged the winter tourist industry, above all English visitors and Parisians followed by the impressionist painters such as Berthe Morisot, Claude Monet, Renoir. The railways also opened markets for roses and, later, carnations, to northern Europe and created the fortune of Sanremo. Today, there is intense competition from Brazil and the near east for a slice of the winter flower market: The Red Tequila Roses of the Riviera is the result of constant experimentation by Sanremo's growers to develop new strains that will tempt flower lovers. Over a number of years Matthew Moss painted a series of landscapes of three sister villages in the eastern part of the Italian Riviera, Costarainera, Cipressa and Lingueglietta. These scenes were usually shown from below looking upwards and putting into relief the terraced hillsides that end usually in a fortified village dominated by the churchtower. 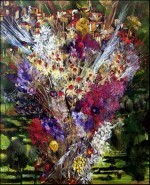 'Bouquet of Flowers against the Italian Riviera landscape of Lingueglietta' represents one of those paintings. After the landscape had been completed the artist modified it, quite a number of years later. The artist did this to a number of his Ligurian landscapes. The changes Matthew made were, usually, placing a vase or a bouquet of flowers in the centre of the composition and allowing the original landscape to emerge from around the edges or peering through the flower composition. 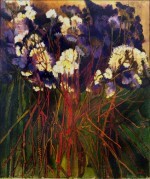 The massive corsage that dominates the foreground is a mix of varying tones of red blue and violet and, acting as a foil to the colours of the floral composition, silvery-white foliage. This classical flower arrangement brings to mind the flowerpieces that Jan Brueghel de Velours (Peter Paul Rubens' friend and collaborator) painted for Cardinal Federico Borromeo, Archbishop of Milan. The village of Lingueglietta, partly hidden, is the landscape that appears in the background of this painting. It was not unusual for artists of previous generations to change arbitrarily paintings they had painted at an earlier period. With the free market in paintings that developed during the golden age of Flemish and Dutch paintings in the 1600s, where the artist had more control over the end use of his work of art this often occurred. The most notorious example of this right to change casually the style of a work of art is Peter Paul Rubens in the 'Le Chapeau de Paille' and 'Autumn Landscape with a View of Het Steen in the Early Morning' begun as a small panel painting. As Rubens worked he added new pieces of timber until it ended up as a painting 131 x 229 cm. consisting of seventeen pieces of oak timber glued together. Most of the works that Moss completed during the time he spent in Australia were landscape imbued with a light that was unique to Australia and that he tried to convey in his paintings of south west Victoria. The major part of these subjects were completed out of doors: paintings of old abandoned Victorian timber-clad farmhouses, railroads, buildings, bridges in an architecture dominated by the omnipresent timber of Eucalyptus trees and the impenetrable bush. These small timber-cuttings towns like Moe and Morewell in the Gippsland region were the scene subsequently, in early 2009, of massive bushfires the cause of much loss of life and property. Australian flowers in colonial Melbourne is one of the few urban works of art the painter completed in this period. The Australian flowers are painted in sombre tones against a background of a timber shuttered window in Victorian-era Vincent Place in the centre of Melbourne. The slatted timber window shutter in the background conveys something of the european quality of the city not dissimilar to New Orleans or a southern European mediterranean city. As a child Matthew Moss was fascinated by the different forms that colour could assume, shards of glass, from the rich brown of Guinness bottles, the ruby-red glass of night lights, to the exotic dark blues of mysterious medicine bottles. The dark rich green of the Perrier bottle and its contrasting yellow label were an almost obligatory subject to insert into the composition when the artist composed this still life. It seems almost one with the leeks that form the lower right side of the canvas, not to mention the green of the geranium and artichoke leaves. Autumn Still-Life with Perrier is an original and beautiful rendering of a subject universally loved by artists from ancient Egypt and China to modern times. When you leave the mediterranean coast on the Italian Riviera and head inland through the Valle Argentina on your way to Triora - the last documented witch cove of medieval times - you reach Prati Piani. The area is quite flat allowing it to host an August bank holiday kite flying festival. The festival is especially popular with locals coming from Imperia to Ventimiglia to picnic on the grass amongst the olive trees and woodlands. Matthew has done a number of drawings and watercolours in Prati Piani over the years. 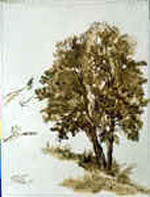 The tree and the two figures were created in sepia using a reed pen and washes of colour. The work of art is significant as the artist later incorporated it into a major oil canvas, one of the most important landscape paintings to come out of the Principality of Monaco in recent years. In this later painting, entitled 'Monaco Mon Amour,'* one of the young kite flyers have been transported from Prati Piani to stand below the sheer rock and stone defense walls of the Rock of Monaco near Place d'Armes flying his kite beside a somewhat similar tree. 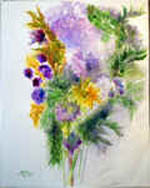 Matthew Moss' bouquet of violet flowers is a melange of various tints of violet and a good example of the freedom that the alla-prima technique of watercolour painting allows. The technique, more common in ancient Chinese and Japanese painting, is to fix clearly in ones mental eye the form of the scene before you, and draw or paint from the image rather than directly from the subject. On the other hand - Leonardo da Vinci and Jan van Eyck are good examples - the artist from the Renaissance until recent times observed the subject with a scholar’s eye. By the nineteenth century scientific observation and recording of nature, influenced in no small part by the scientific archaeology concepts of Johann Joachim Winkelmann had gained prominence permitting of great detail in drawings. The most complete example of this close and careful study of nature are the minutiae of plants, weapons and archaeological details found in the massively large1854 canvas that Matthew Moss restored in the National Gallery of Ireland, painted by the Irish Victorian painter Daniel Maclise entitled, ‘The Marriage of Aoife and Strongbow” . 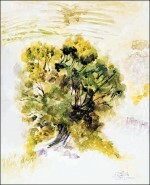 The watercolour in green washes was painted in Prati Piani as was the ‘Two children flying kites by the oak tree at Prati Piani in the Ligurian Riviera’. In the background, faintly seen are the stepped terraces cut out of the hills. Here for two and a half thousand years Celts and then Ligurians have survived by cultivating the olive tree. It was until recent times a harsh and poor territory; the only economic escape was to become a mariner sailing out of Marseilles or Genoa, a life described by the Ligurian writer Francesco Biamonti. Another profession, given the closeness of the border, was as a passeur smuggling economic or political refugees in to France. The artist, given the tree’s more abundant foliage probably painted it earlier in the summer. Matthew Moss' Flora has a stylistic affinity to the works of Florentine Mannerist painters of the sixteenth century, Pontormo, Rosso Fiorentino and Domenico Beccafumi. These high-renaissance masters were greatly admired by English seventeenth-century collectors amongst whom Charles l. In Baroque seventeenth-century art, Flora was a popular subject and, in Holland, was treated on at least two occasions by Rembrandt van Rijn. One canvas, possibly, a portrait of his wife Saskia now in the Hermitage was executed in 1634 and another, of slightly smaller dimensions but of about the same period, in the London National Gallery. 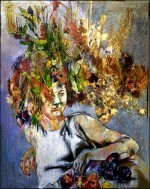 Matthew began his version of the Roman Goddess Flora as a still-life painting of flowers and green and autumnal-brown leaves. Rather than add a landscape background of the hills and mountain villages as he had intended, the artist reversed the canvas 180° and in place of the terraced olive groves of Costarainera in Liguria he inserted the figure of a young Italian woman. To balance the floral composition in the top left of the painting he added, in the bottom right a still-life of fruit, that, in addition, acts as a frame to the enigmatic look of the girl intensified by the cluster of leaves that conceal her right eye. 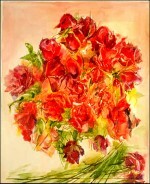 Antonio Marchese in Sanremo developed a new hybrid rose in 2005 that Matthew has used as the subject for this painting. The subtle colours of the flower, soft cold pinks and cobalt blue tints are the ideal subject for treatment in watercolour. 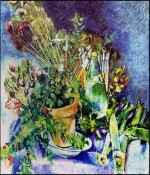 The work was created using a fine sable brush (or 'pencil' as older painters used to call them) to create washes of cobalt violet and blue and light cadmiums together with various shades of pink and greens. The flower became a Sanremo success when the Vatican in Rome ordered, in 2007, thousands of sprigs of Rosa Mistica to embellish a reception greeting new cardinals. The rose's name initially 'Harem' was modified, for diplomatic reasons, to Rosa Mistica. This image was captured by the artist during a walk from the ancient village of Costa Rainera on the thousand year old cobbled path bordered by dry-stone walls from which sprout the distorted trunks of wild fig trees to join the hillside Ligurian village to the Italian riviera seaside town of San Lorenzo al Mare. These short-lived wild flowers often survive for less than forty eight hours. Their existence may be due to the rare micro climate that exists in the three-village region of Cipressa, Lingueglietta and Costarainera; about half way down the path one reaches a particular point where there is a perceptible change of temperature and humidity. The watercolour technique is the ideal medium to capture the fugitive colours and rare forms of these plants in the short time that the artist has at his disposal before they fade and die. Shortly after his return to the Italian riviera from north east Queensland in the Australian tropics, Matthew Moss painted this canvas. It still contains some of the elements he had acquired painting in the mangrove swamps of Mission Beech; the flowers' stems mirror the twisted roots and trunks of the tropical plants emerging from the clay and mud of the marshes. 'White and Violet Flowers of the Mediterranean' still contains some of symbol-like elements of Roberto Matta's paintings that had so impressed Matthew in the surrealist artist's Piazza di Spagna exhibitions in Rome in the first half of the 1960s. More evident in the painting's overall composition, the massed forms of the elements dominating the centre is Moss' debt to the Berlinois Wols (Otto Wolfgang Schulz) an 1940s 'informel' precursor of the New York school of 1950s abstract expressionism. The still fife, painted onto a white primed Belgian linen canvas is composed of soft light greens, whites and pale yellows against a lightly tinted blue background. The painting begins as a drawing of a pot plant with the organic form developed to the point where the abstract forms are predominant. Some traces are visible of an earlier influence of Echaurren Matta although Matta's style and that of Tanguy makes use of invented forms or of the human figure influenced by Picasso's style of the 1940s. In this painting, the same type of calligraphy, in the sense of drawing onto the canvas and then filling in between the fines, is more firmly based on the forms of nature that are used as a point of departure. 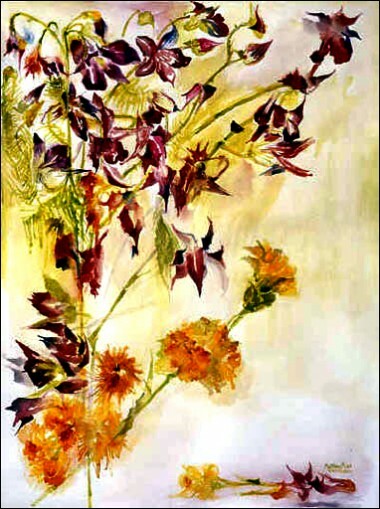 The painting began as a watercolour on paper of a begonia plant, unsigned, but circa 1976, rich in red lakes, indian yellows, blues, greens and brown earths. A first version of the painting, later destroyed paid closer attention to the original colours of the watercolour. 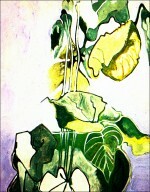 The second version concentrates on the undulating forms of the stems and the drooping heads of the begonia. The wide flat leaves have been reduced to schematic forms, the absence of warm colours and the resulting grisaille work concentrate the eye on the weaving sinuous fines and shapes. The painting was exhibited in Sydney and in Melbourne, Australia and later in New York.. 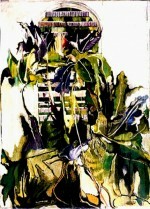 The title of Moss' painting created amusement among visitors to the Manhattan exhibition as, apparently, the title evoked a different meaning than that in Europe. A case, as a fellow Irishman on an earlier to the United States, Oscar Wilde of two peoples divided by a common language. 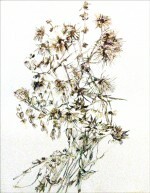 The artist's sepia painting, done with a hand-cut reed pen, shows what may be the same painting that you see in 'Italian Riviera wildflowers of Costa Rainera. '* By now the wildflowers have faded and lost their ephemeral beautiful and pastel-like tints and assume - it would seem - the skeleton forms of a painting by the Armenian USA expressionist Arshile Gorky. 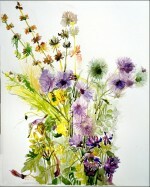 In place of the flowers' petals there are seed pods particularly noticeable on the centre and top left of the drawing. You can see in the background of the watercolour traces of the the roughly sketched in pencil outline that Matthew Moss created to define the work of art's structure. The artist's intention in laying out this skeleton was to create a composition that covered the watercolour paper support from the bottom left, and, in a diagonal direction, move up to the top right of the support. Despite the impromptu nature of artist Moss' watercolours of flowers it is evident of the importance he attached to creating a strong underlying structure and almost classic attention to the work of art's basic composition.